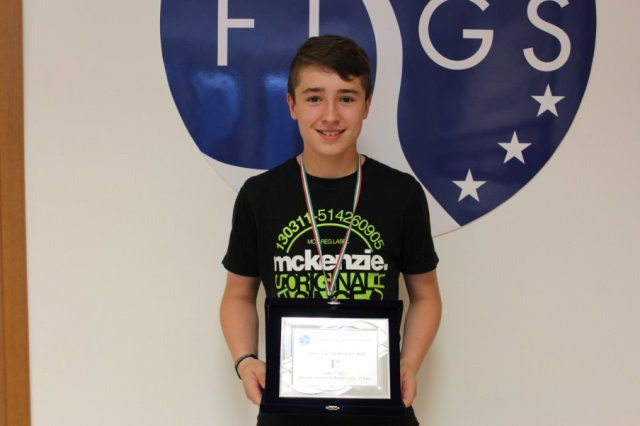 Carrie Hallam and Alasdair Prott claimed the Girls U17 and Boys U13 titles respectively at the Italian Junior Open in Riccione, Italy this past weekend (20-22 June). Carrie made her breakthrough in the quarter-finals when she defeated the No.1 seed and European No.12, Kristýna Fialová from the Czech Republic, 3-0 (11/2 11/3 12/10). A straight forward win in the semi-finals over home favourite, Paola Moretti (ITA), put her through to the final where she faced Emily Woodworth (USA). Both girls started the match looking tense and evenly matched, with nothing to separate them for the majority of the opening game. 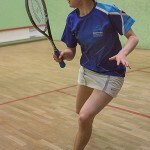 Carrie was eventually able to pull clear at the end of the game to take a 1-0 lead and quickly went 7/3 up in the 2nd. However, her opponent fought back strongly to level at one-all and won a tie-break in the 3rd to go 2-1 up. Perhaps sensing that she had nothing to lose, Carrie started to relax and use the front court more effectively as she came back to win 11/9 8/11 10/12 11/5 11/6 to add to her Irish Junior Open win earlier in the season. In doing so, she becomes the first Scottish player for over a decade to win 2 ESF Junior Circuit titles in the same season. Her win should also see her move up into the top 10 when the updated European Junior Rankings are released at the start of July. Alasdair, seeded 2 and already ranked 6th in Europe, secured his anticipated place in the final with some comfortable 3-0 wins and rarely looked troubled along the way. In the final he faced top seed and current European No.2, Tamás Devald of Hungary. A slow start saw him lose the first game 11/8 but he gradually worked his way into the match to triumph 8/11 11/4 11/6 11/5 and claim his first ESF title. 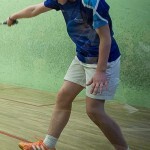 With his 13th birthday fast approaching, Alasdair will shortly move up to U15 where he will no doubt find the competition much tougher but having already played at No.1 for Scotland at the recent European Team Championships, where he performed admirably and more than held his own, he certainly looks up for the challenge. 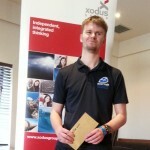 Craig Valente-Wallace and David Beaumont were Scotland’s only other participants in the event, both competing in the Boys U19 category. Craig reached the quarter-finals where he lost to the eventual champion, Yuri Farnetti (ITA), before eventually finishing 8th, while David lost in the plate final to finish in 18th position.